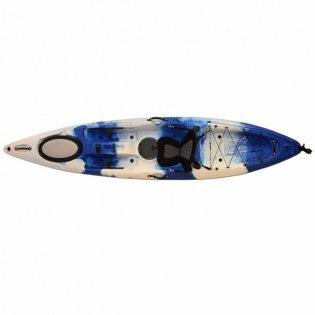 Judging by the name and the amount of "Pro" and "Deluxe" adjectives that they tacked on to it, Vanhunks clearly intended the Tarpon "Silver King" 12'0 Pro Deluxe Fishing Kayak to be one of their flagship offerings. This can also be seen in the amount of extras and features that is included with the Silver King, so thankfully it's not just empty words. The Silver King is a 12ft, sit on top fishing kayak that is 30 inches wide and weighs about 62 lbs. It has a maximum weight capacity of 550lbs and is constructed from premium quality UV protected polyethylene materials. Vanhunks has so much faith in the construction of the hull that they offer a lifetime warranty on it, while the rest of the parts and components come with a 12-month factory manufacturing warranty. Overall, it is a pretty sturdy kayak, thanks to the roto molded 5mm polyethylene design and the marine graded stainless steel fittings used by Vanhunks. The Silver King is designed first and foremost to be a fishing kayak, so it features everything you would expect from one. This includes a deluxe foam padded seat, two fishing rod holders, one swivel rod holder, waterproof hatch covers and a back storage area with bungee. Like the other Vanhunks kayaks, this one is very easy to maneuver as it makes use of food pedals along with a rudder system. The foot pedals are designed to move the rudder left or right and can be adjusted according to your weight. This makes the job of paddling where you want to be a little easier and the Silver King is also quite stable to boot. Speaking of paddling, the Silver King comes with a two piece paddle, which allows for three position adjustments. It also has all the other kayak essentials, such as rubber carry handles, drain covers, a drain plug and even a cup-holder. Overall, the Silver King is probably not the greatest fishing kayak on the market, but it certainly offers a lot for the price and it is definitely worth a look if you want to explore beyond the usual well-known brands.